Does Green Blood Give Some Lizards An Edge? : Shots - Health News Scientists are trying to figure out how green-blooded lizards might benefit from the unusual pigment. The answer could provide new insights into human illnesses like jaundice and malaria. 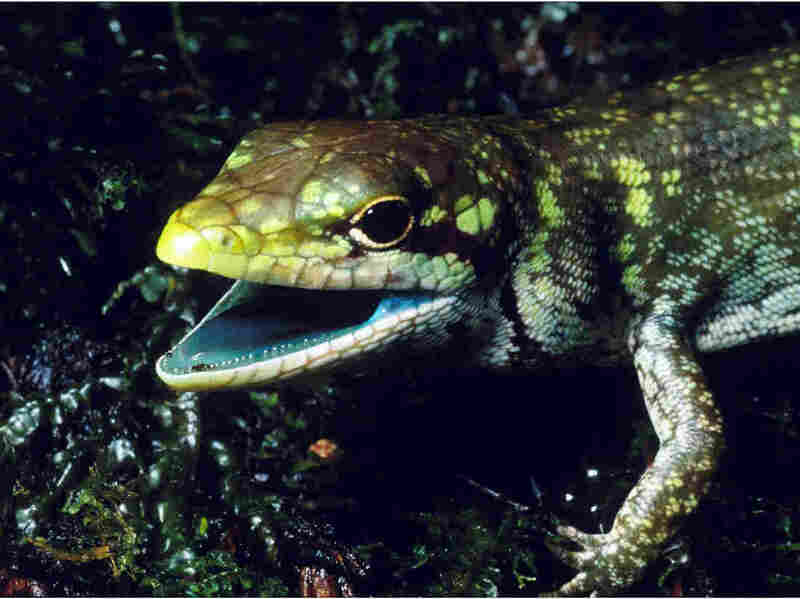 The prehensile-tailed skink from the highlands of New Guinea has green blood caused by high concentrations of the green bile pigment biliverdin. Kermit the Frog used to sing that it wasn't easy being green, but that isn't the case for some real-life lizards. They apparently find being green so easy that even their blood is green. A study published Tuesday suggests seems that this lime-green blood has evolved independently several times in lizards. Scientists are now trying to understand how these lizards might benefit from blood that's green. The answer could provide new insights into human illnesses like jaundice and malaria. The weird blood has been found in skinks that live in New Guinea, an island off of Australia, and its bright color is striking. "There's so much green pigment in the blood that it overshadows the brilliant crimson coloration of red blood cells," says Chris Austin, a biologist at Louisiana State University who has studied these lizards for decades. "The bones are green, the muscles are green, the tissues are green, the tongue and mucosal lining is green." All that green comes from high levels of biliverdin, a toxic waste product made during the body's normal breakdown of red blood cells. In humans, high levels of a similar bile pigment called bilirubin make people sick with jaundice, but the lizards seem unaffected. "I find it just absolutely remarkable that you've got this group of vertebrates, these lizards, that have a level of biliverdin that would kill a human being, and yet they're out catching insects and living lizard lives," says Susan Perkins, a researcher at the American Museum of Natural History in New York. In the past, scientists had assumed that lizards with this green blood must belong to one closely related group. But these lizard species don't look alike and have different lifestyles, with some laying eggs and others giving birth to live young. So Austin, Perkins, and their colleague Zachary Rodriguez decided to create a kind of lizard family tree by studying the DNA of 51 Australasian skink species, including six species that have green blood. It turns out that the green-blooded lizards are not each other's closest relatives, according to a report in the journal Science Advances. A centrifuge can separate the components of lizard blood. In this tube, red blood cells are on the right and green blood plasma is on the left. This sample came from the green-blooded lizard Prasinohaema prehensicauda, which lives in the highlands of New Guinea. What the researchers found instead suggests that the ancestors of all of the lizards had red blood, and that green blood then evolved independently four times, in separate lineages. "Our data strongly supports that scenario of four independent origins of green blood," says Austin, adding that the team is doing follow-up genetic work to confirm this. If that turns out to be true, the question is why some lizards would find it easier to be green. "There really is a fundamental purpose of this trait," says Perkins. "We just don't necessarily know exactly what it is right now." Austin initially thought that the buildup of biliverdin might deter predators by making the lizards distasteful. But he's offered the green-blooded lizards to captive birds, and the birds gobbled them right up. What's more, he's personally eaten raw red-blooded skinks and green-blooded skinks, and found that both tasted about the same—kind of like "bad sushi," says Austin. Another possible benefit the researchers considered was that all the extra green made for better camouflage in green leaves. But Rodriguez says, that can't be it. "The problem is that there's green-blooded lizards that aren't green, and there's red-blooded lizards that are green," he explains. Lately the scientists have been wondering if the lizards' green blood might protect them from parasites like malaria — although Austin admits that this is "pretty speculative." He notes that test tube experiments have shown that moderately elevated levels of bilirubin seem to protect against human malaria infection — and hundreds of malaria species are known to infect lizards. 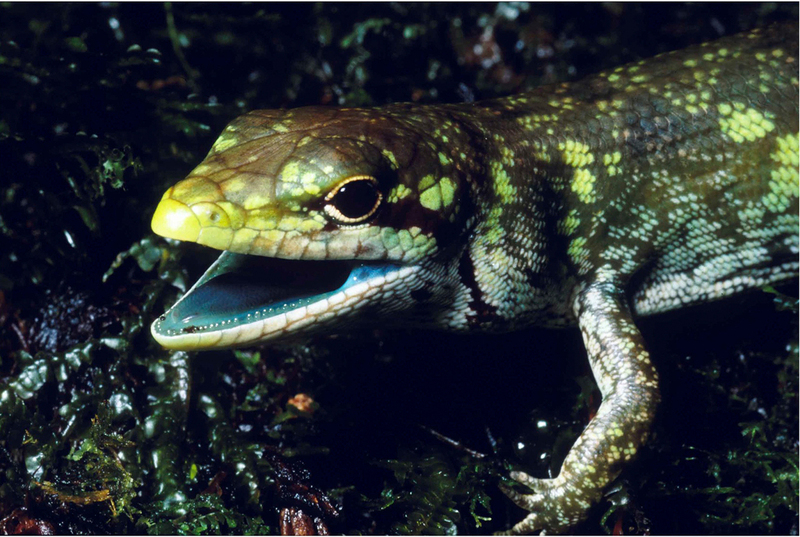 If the green blood is protective against malaria, it's not perfectly so, because they've found a malarial parasite living inside a green-blooded lizard, says Perkins. Still, they're continuing to explore what kind of relationship there might be between malaria and green blood. This basic research might someday lead to a better understanding of both this disease and jaundice, says Rodriguez. He notes that elevated levels of biliverdin have been found in some fish, and they may also explain the green blood in some frogs. "It's rare in the animal kingdom," says Rodriguez, "but because it does appear, this suggests there has to be some beneficial properties to green blood."